Home Gear & Ammo Ammunition .338 Lapua Mag: The Ultimate Long-Range Round? The .338 Norma (left) and parent Lapua are champs at four-digit yardages. Snipers agree! .338 Lapua Mag: The Ultimate Long-Range Round? The .338 Lapua Mag. dates to 1983, when Research Armament Industries, in the U.S., outlined plans for a sniper cartridge driving a 250-grain .338 bullet at 3,000 fps. The sleek FMJ missile would penetrate five layers of body armor at 1,000 meters (1,094 yards). RAI chose the Rigby case, for its modern rimless design and great capacity. But the .416 was born in a gentler time and configured for a maximum pressure of 47,137 psi. The .338 Lapua (left) has a big advantage downrange over the .300 Winchester and .30-06. The new .338 would exceed that limit. To guard against unacceptable case stretching and possible separation, the Rigby’s hull would get a thicker, harder web. RAI contacted BELL (Bell Extrusion Laboratories) of Bensenville, Illinois, to make the brass. Alas, the first batch didn’t meet specs. In 1984, after building a test rifle and procuring bullets from Hornady, RAI looked to Lapua for help in pushing the project forward. Shortly thereafter, financial difficulties forced RAI out. The .338-416 project was officially cancelled. Lapua found it worth pursuing. Partnering with Accuracy International, a young British firm, Lapua changed the dimensions and composition of the Rigby hull to brook pressures exceeding 60,000 psi. The .338 Lapua was registered, in 1989, with the CIP (Commission Internationale Permanente pour l’Epreuve des Armes a Feu Portatives). Europe’s CIP is the equivalent of SAAMI (Sporting Arms and Ammunition Manufacturers Institute), in the U.S. Both organizations provide manufacturing standards for the firearms industry. Data for the .338 Lapua specifies a maximum pressure of 60,916 psi (piezo measure). During its development, the 300-grain Sierra MatchKing was not yet in production. Lapua’s 250-grain LockBase VLD bullet, and the 250 Scenar, met the 3,000-fps target, generating about 4,890 ft-lbs at the muzzle. A hunting load hurling a 250-grain Nosler Partition clocked 2,940 fps. Current loads with 300-grain Sierra MatchKings exit at 2,710 fps. Lapua’s 300-grain Scenars reach 2,750 fps, carry 5,000 ft-lbs. 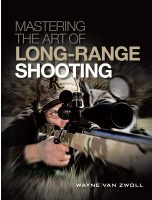 This article is an excerpt from Mastering the Art of Long-Range Shooting, by Wayne van Zwoll. ❰Video: How Many Water Balloons Does it Take to Stop a Bullet? Not long after the .338 Lapua was introduced, Ross Seyfried quickly wrote of the uncanny similarity of the new cartridge with his mentor’s .338-378 Keith-Thomson, albeit without the latter cartridge’s belt. It appears that Ross was closer to the truth than most imagine. The earliest rifles chambered for the new cartridge were built by Champlin-Haskins Firearms. Keith, Thomson, Bill Jordan, and George Gelman were among the first recipients. Keith already had history with the company. Not long after Jerry D. Haskins had developed his new 3-lug magnum action, he had reportedly consulted Keith for his suggestions on the features for a custom rifle offering. In honor of his participation, Doug Champlin and Haskins named the top-grade version of their custom rifle, the “Keith-grade”. Haskins later parted ways with Champlin, and to the best of my knowledge, is the same Jerry Haskins who later started Research Armaments Inc. (AKA: Research Armaments Prototypes). RAI is probably best remembered for their .50 BMG rifle, the Model 500 “Long Range Stand Off Weapon”, marketed at varying points by Iver Johnson/AMAC and Daisy. The smaller Model 300 “Convertible Long Range Rifle” was chambered for their wildcat .338/416 (8.58x71mm). Both rifles and the 8.58x71mm wildcat were reportedly developed on behalf of the US Navy’s Special Warfare community.